The Chess Store is a prominent online chess retailer from US. It stores a wide variety of chess products from renowned chess manufacturers and also offers its own line of chess sets and items. Below is a short list of some of the most popular and highly rated chess products sold at the store. In the next section, you’ll find a thechessstore.com Review that shares some pertinent information about the brand that we hope will help you make an informed choice once you are considering buying an online chess product from this Store. This Crusade themed set of chess pieces in reds and whites ranks among the most frequently sold items via thechessstore.com. This is understandable considering the fact that this fine set of polystone chessmen comes from the renowned Italian chess manufacturers Italfama. The chessmen are designed on the theme of the Crusade—the Holy War that involved the Arab World and the Christian Europe in both parties’ bid to stake their claim on the Holy Land and that spanned for almost three centuries. As you can expect from a brand such as Italfama, these hand painted pieces full with exquisite details are finely crafted and the design and the quality are of the highest order. The chessmen are made of polystone—a compound that is a mix of powdered stone and polyurethane resin. The compound is extremely hard and durable and has a stone or porcelain-like feeling to them. Beware though that if dropped on a hard surface, the pieces may break or get damaged. The king height and the king base: 3.25″ and 1.125″, respectively. Chessboard not included but it is recommended that you use 1.75″ – 2″ squares for this chess set. The package includes, besides the 32 chess pieces, a decorative formed tray for piece storage. Unlike the previous item, this chess set is a proprietary product from thechessstore. The classic, no-frill design of these beautiful acacia and boxwood chessmen make them perfect choice for chess lovers who want to keep it simple without compromising on the elegance factor. All pieces on the set are carefully hand polished with solid lacquer and this gives the pieces a soft but beautiful sheen. The pieces are also equipped with green baize cloth pads for a soft feel as well as for preserving the surface of the board you are playing on. The king height on this set is 3.75″ and the set also includes two extra queens for spawn promotion. Now, you’ve the option to buy this set of chessmen individually but our suggestion is that you purchase the chessmen and board combo since this set of chessmen fits nicely with the Chess Store’s standard Maple and Walnut chess board. The colors, details and the product quality of the board and the pieces nicely complement each other and the combo pack will also help you save a few bucks than if you bought the products separately. If you want a stable and well-made complete chess pack that you can carry around frequently, this chess set, again a proprietary product of the Store, is an ideal solution. Although the chessmen are made of plastic, they are durable enough and the fact that they are triple weighted accounts for their exceptional stability. The pieces are standard Ivory and Black with the king standing at 3.75 inches tall. Also included are two spare queens for purposes of prawn promotion. The vinyl roll-up board with cloth backing, likewise, is well made and will withstand the wear and tear of frequent travels. However, in our opinion, the standout feature of this complete pack is the large carry-all canvas bag that is thoughtfully designed to keep your chess materials in good conditions. You can store in the chessmen in two separate zippered compartments. There are also separate pockets for storing chess clock, notebooks, etc. and the roll-up chess board is firmly held in place by two velcro straps. This chess set from Italfama is a perennial favorite with chess collectors and especially those who nurture a special fondness for all things ancient Egypt. So, it’s hardly surprising that this set also happens to be one of the most frequently sold products at thechessstore.com, despite its somewhat high end price. As for the set itself, when it comes to Italfama, there are few brands that can match the high degree of craftsmanship that go into the products of this Florentine chess manufacturer. The nickel and brass plated metal pieces are cast from solid zinc and Italfama has used the age-old, proven and trusted lost wax casting process to give the pieces stability, durability and that heavy feel that most chess players delight in. The pieces are quite tall, too, with a towering 5″ king that comes with a 1.5 inch square base. The pieces represent many real and mythical figures from ancient Egypt including the Pharaoh and the Queen, the Egyptian gods Mafdet and Horus, the Sphinx and the Oblisk and more. This 15 lbs set comes well packed in a fancy Italfama gold & green cardboard box and it also features a Certificate of Authenticity from Italfama. We include this set on our list as a proof of Chess Store’s good insight into customer expectations and their earnest effort to meet the same. As we’ve mentioned, the Egyptian theme pieces, although highly popular, are pretty expensive. So, the Chess Store, in agreement with Italfama, has designed a product of its own that for the most part is a reproduction of the Italfama Egyptian pieces but is offered at a much lower price point. Unlike the metal pieces of Italfama, the chessmen on this set are made of polystone. The pieces are also not as tall as the original pieces and are spearheaded with a standard 3.75″ king. All pieces are hand painted and are equipped with felt bottom pads. In all, the set can well be considered as a great specimen of an antique reproduction chess set. 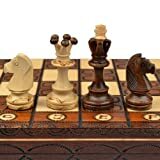 And as with the German Knight Set, you can consider buying these pieces in combination with the chessstore.com’s gorgeous Walnut standard chess board. Since we are on the subject of reproduction sets, we might as well mention this beautiful antique set designed and offered by the Chess Store. Many different variations of French Regency sets were extremely popular among chess lovers of Paris in the early decades of the 19th century. And this reproduction set is designed after the most prevalent and popular French Regency variation from that time. The set will be particularly appreciated by chess players who like to play their chess with somewhat quaint or, at any rate, less standard chessmen. The carefully weighted pieces are made from genuine ebony and boxwood and are hand polished to achieve a beautiful sheen that will only mature with age. So, if you find the price of the set a bit on the higher side, you know there are adequate reasons for that and you’ll get your money’s worth with this item. The figures are quite tall as well with the king standing at 4.3 inches tall and the whole set weighing 39 oz. It is recommended that you use this set on a board that comes with squares of about 2.5 inches. To cap our list, here is something that will take your breath away. The sheer luxury of this set, once again from Italfama, will make any chess collector drool at this item with silver and gold plated chess pieces combined with a chess board with stained veneer and wood frame. The board dimensions are 24″ x 24″ x 1″ and the king height is 5 inches. The set will last for generations, so as long as the price is not a factor…well, you know! The Chess Store, Inc., operating out of Hillsboro, Oregon, is one of the leading online US chess stores that cater to an international audience as well. They have a huge variety of products in their collection. Many of them are their own proprietary products but they also sell products from pretty much all famous chess merchandise manufacturers from all over the world. These include: DGT, Chronos, Italfama, ChessBase, BHB, Everyman Chess, Cardogan and many many more. So, it acts as one of those few one-stop-shop destinations for chess lovers. Surprisingly enough, we couldn’t find too much of an information about the history of this brand. This is somewhat of an anomaly, especially for a chess store that also runs a production unit, since most chess products manufacturers normally provide a good host of information regarding their origin, history, background, track record, manufacturing details, etc. About the Chess Store, all that we could find from their ‘About Us’ page is that the company started its journey back in 1999 which means that it can boast of two decades of experience and expertise. The Chess Store uses FedEx and USPS for all their international and domestic shipping. Shipping rates vary depending on location as well as the weight of the package. However, the store provides free shipping within continental US for all orders over $75 but as long as the total package weight does not exceed the 1 pound limit. In addition to that, FedEx offers some discounts on certain shipping orders and in such cases, the store passes on the discount to the customer. When it comes to their Returns Policy, the store offers a 30-day window for customers for returning a product. You may return an item if it does not fulfill your expectations. In such cases, you’ll receive a full refund from the store although the store will not reimburse any return shipping fees. The latter will only apply for cases where a customer has been shipped a wrong item or if the item shipped was a defective one. Most products sold at the Chess Store are refundable, but few are not. Those falling in the latter category are marked as not returnable or refundable in their respective product description page, so keep an eye for that when placing your order. As you can expect from a large online chess products retailer, Chess Store offers a huge variety of chess items that pretty much cover all chess equipment and accessories you’ll ever need to play the game or for display purposes. Apart from accessories such as chess clocks, chess bags or classroom or club supplies such as demo boards, scorebooks, trophies, etc., the store can rightfully boast of a huge selection of chess pieces and boards covering a wide spectrum of materials, styles and prices. However, we were most impressed by their collection of theme chess pieces, wooden boards, antique reproduction sets and garden sets. Well, it’s pretty difficult to name any average price for such a great variety of products. All we can say that the store offers items from all different product categories at many different price points—from affordable to high end right to some products that may well break your bank! Chessusa.com, chessbazaar.com, chesshouse.com, chesswarehouse.com—these are some of the closest competitors to thechessstore.com. All of them are reliable chess retailers and are very through and meticulous when it comes to inspecting the product quality of each item they sell. And as with the Chess Store, the other stores also offer different promotional deals, volume discounts and so on. So, it’s pretty tough to rate these retailers. However, from what we can find from different chess forums, Chess Store excels most competitors when it comes to product quality check. On the flip side, their customer support may not be as good as some other sites. Recently, the Chess Store has started offering a unique ‘low price guarantee’ that maintains that if any of the products sold at thechessstore.com is available at a lower price ‘anywhere on the internet’, they will refund the difference to you. For example, the very first item on our list—the Crusade Chess set—is priced $119 at chessusa.com whereas the listed price for the same item at the Chess Store is $130. In such cases, if the customer notifies Chess Store about the difference and if both are the very same products with the same product code, the Chess Store will match the price by refunding the difference to you.